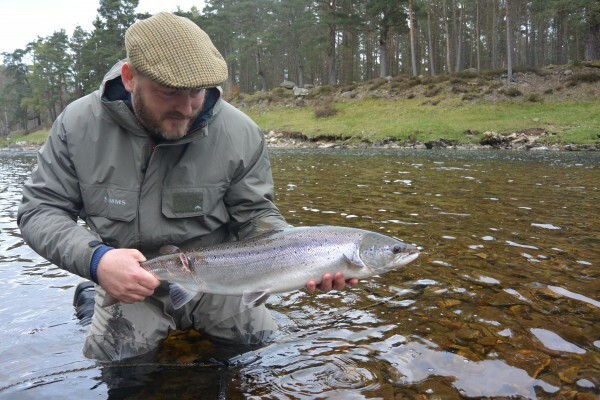 Every year, in late April, I have the great pleasure of opening my salmon fishing season in Scotland. Just like in Norway, the weather and river conditions are x-factors that make every experience different from eachother. Before heading for the lovely River Spey, and our annual week on Ballindalloch, my brother, Terje, and I had booked a day on the Dee. 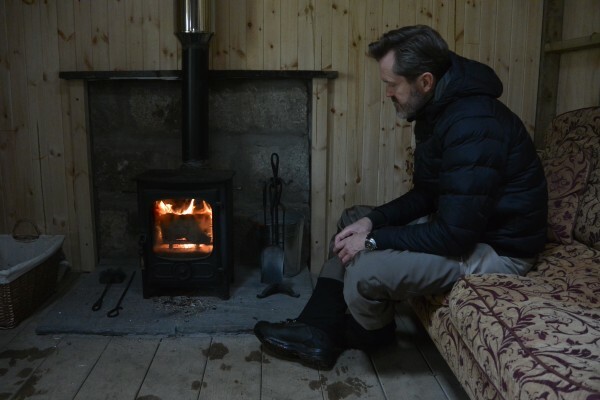 You know…just to warm up the casting arms & to sample a fine single malt or five. The beat, Lower Woodend, was new to us both. The owner, however, very kindly offered to meet us the afternoon before our days’ fishing, in order to show us around the beat and to point out the hotspots. Very much appreciated and encouraging to see lots of fish showing. The water level, however, was rather low, which it had been for quite some time, and connecting with the springers would obviously be tricky. But, then again, sometimes you do catch fish even though conditions are crap. 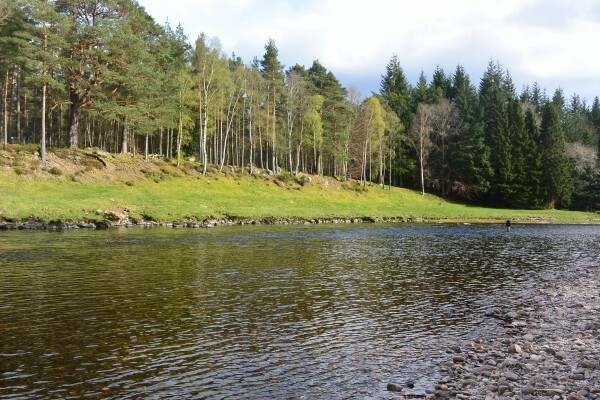 Next day, after enjoying an early breakfast at our Banchory hq, we headed for the river – full of anticipation. It was a perfect day for salmon fishing: Hardly any wind, a cloudy sky and rather mild. Our usual optimism increased even more, when several fish jumped to say hello within minutes after parking our car. And, when paying the smart, little toilet a visit, I became even more confident that we’d be successful: There, you see, on the wall (from the sitting-down-and-…you know-point-of view), was a portrait of the Norwegian King and Queen! I started in the very attractive Hut Pool. It only took a few casts before I had a good pull, but – for the next few hours – that was all the action we had. As expected the salmon, both resident fish and the odd fresh ones, proved very diffucult to tempt. Between us, my brother and I tried every trick in the book – and even a couple more – but no response whatsoever. Following a brillant lunch, which we picked up from the village shop in Kincardine (highly recommended! ), we continued experimenting. But neither small or big flies, dull ones or colorful ones, fished at various depths, managed to provoke a proper take. A bit frustrating, of course, because the salmon kept showing throughout the whole beat. Finally, just after 6 p.m., I decided to go deep. Seriously deep. I put on my heaviest tip, and dug out the biggest Red Frances I got. Hut Pool next. I was pretty sure I’d get stuck at the bottom, but, then again, drone pictures that my brother had taken revealed a section of the pool that seemed to be surprisingly deep. So, indeed, I thought it was worth a try. I concentrated on the deep spot, and would you believe…on the fourth cast the line suddenly tightened. A couple of seconds or so later, I lifted my rod and the fight was on. How wonderful it is to finally connect, to hear a screaming reel and to feel the incredible power of a wild, fit and grumpy salmon. Going Dee(p) worked quite well! I played it hard, as I usually do with fish I’m putting back, and it did not take too long before my brother was able to net the fish. Not the biggest chap in the world, around 8 lbs, but what a reward after a long and, up to that point, fruitless day on the river. The fish had nasty seal scars on both sides, but it did not seem the affect its health and we were happy to let the Scottish King go back to find his Queen. A great round up of a great day. 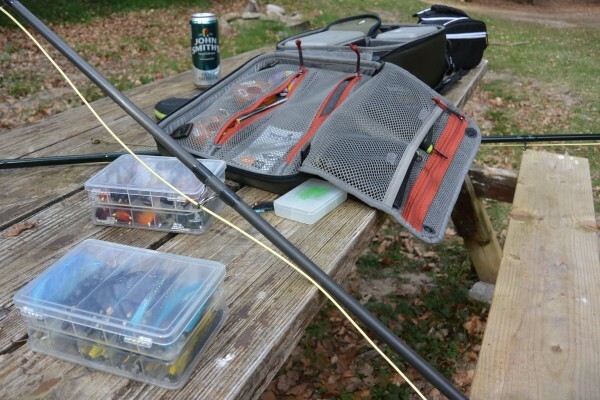 I can warmly recommend Lower Woodend, which does give the angler good value for money and very pleasant company at the toilet. 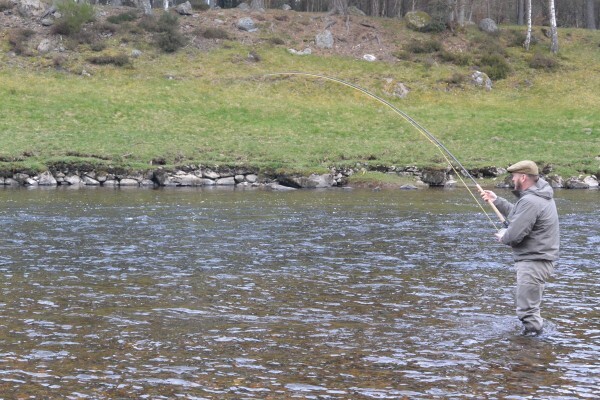 How did we do on the Spey? Well, challenging conditions with snow falls, strong winds and a minor flood. But our party managed to land a few fish – but that, friends, is another story.